« Take the Armory Poll – What Would YOU do With the Armory? 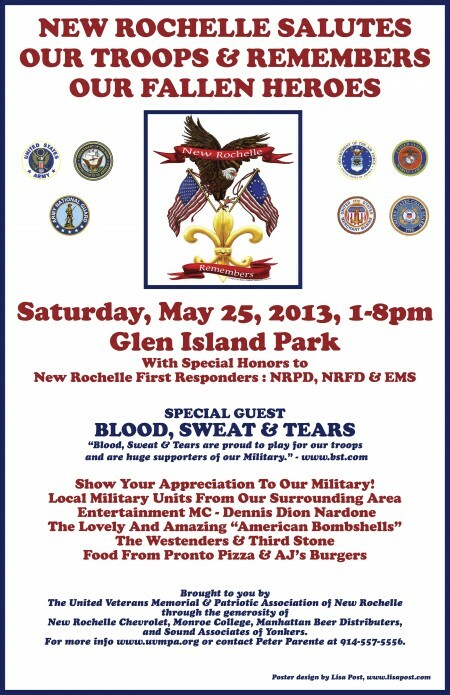 Memorial Day is This Weekend and New Rochelle Remembers – Will You? The parade may have been curtailed, but that won’t stop New Rochelle from taking the time to remember our fallen heroes and giving a salute to our troops this weekend down at Glenn Island. The premier New Rochelle event that we have become so fond of will continue at the new venue this Saturday, May 25th between 1:00 and 8:00 PM. Headlining the entertainment for the day will be the one and only Blood Sweat and Tears. Come down and join the fun and show your support for those who have made days like this possible. Here at the Armory group we salute not only the men and women in the service, but we offer a big thank you to those who keep the tradition alive and work so hard to make this day a day to remember. Ooh Rah!